Itemis-jas-662 - Zita Long with Ray [Scott], Jean and Angela, Alberta. 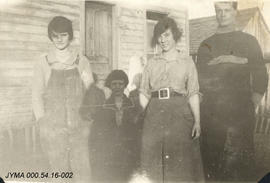 Itemis-jas-663 - Unknown woman with children, Pine Lake, Alberta. Itemis-jas-664 - Jean on horseback. Abe Reimer (born May 20, 1900) grew up in the Didsbury, Alberta area. His parents, Henry L. and Agatha Reimer came from the USA, originally from Europe. Abe had one older brother Jake and a younger sister Marie [Munson]. Abe Reimer came to the Jasper area in the mid 1920s working seasonally at the Milner's Ranch in Hinton. In about 1930 he bought land at Dunster near Tete Jaune, BC. He began an outfitting and guiding business from there. Abe Reimer married Zip (Zita) Long [ca. 1930]. Zip was also from the Didsbury area and had come to Jasper in the early 1920s with her brothers Bert and Fabe. Zip died in the 1940s by her own hand at the Dunster ranch. Abe then worked for his brother Jake's trucking business, "James & Reimer" in late 1940s. In May 1952 Abe married Mary Thorsen. Mary's family (Art Thorsen family) moved to Hinton in 1925 to manage the Milner's ranch. Charles Milner was a conductor for the Canadian National Railway. He and his wife Mabel operated a dairy farm near Jasper and a ranch near Hinton. After the death of her mother (1927), Mary Thorsen came to Jasper to live with the Milners. Mary inherited the Milner's Hinton ranch in 1950. She and Abe operated the ranch raising black angus cattle. Mary had an older sister Emma (Nickerson) and younger brother Art. Art inherited the ranch after Mary's death (1989). Abe Reimer passed away in 1986. The fonds consists of documents and photographs relevant to Abe Reimer and his family. Included is a series regarding Abe Reimer's guide and outfitting business and homestead in Tete Jaune, British Columbia (1930-1944). Contained in this series is correspondence with friends, family, various clients, taxidermy companies and supply companies. Also included are lumbering permits, hand drawn maps, war saving stamps, invoices and receipts for purchases, letterhead and stationary, newspaper and magazine articles, licenses, registrations and income tax forms. One file also contains information regarding Abe's Crown Land grants in the Tete Jaune area. Also in this fonds is correspondence received by Mary Thorsen from friends and family (1927-1933) and documents pertaining to Charles Milner family (1904-1950). The fonds also contains many photographs. Included is Zip Long's photo album (1916-1927), Abe Reimer's photo album [1910-1930] and several series' of photographs. Topics covered are agriculture, guiding and outfitting, backcountry travel; camp scenes, hunting, Milner Dairy, transportation, rodeos, quarries and logging. Many of the photographs also depict family and friends including: Abe Reimer and family members; Zip Long and her brothers Bert and Fabe; Mary (Thorsen) Reimer and brother Art Thorsen; Charlie Milner; the Randall family; Ray Scott; Bruce Otto; Ma and Pa Scott, Art Adams and others. Gift of Jacqueline Hanington, friend of Abe and Mary Reimer.